Hnath playfully reimagines Newton's world with a contemporary conceit and language-stripped of accents and period dialect-as he introduces young Newton to the great Robert Hooke, the most famous and powerful scientist in Britain. The resulting battle of intellects and egos pulses with wit, humor and tension, as the playwright uncovers (and invents) the motivations that drove a young farm boy to become one of the greatest thinkers in human history. "..."Isaac's Eye" looks at the life and work of Sir Isaac Newton in a manner not dissimilar to the way the musical "Bloody Bloody Andrew Jackson" looked at the seventh president of the United States, or playwright Aaron Posner looks at Chekhov in "Stupid F***ing Bird." It's an interesting, intermittently funny and generally quite enjoyable piece. You do, though, get the sense that the playwright is so busy contextualizing his two British subjects - Newton and the older scientist Robert Hooke - that he forgets fully to walk a mile in their shoes." 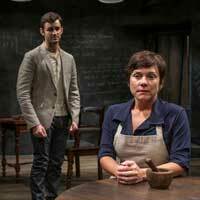 "...In "Isaac's Eye," Lucas Hnath's ingeniously imagined and surprisingly passionate play - now in a searing Midwest premiere at Writers Theatre featuring precision-tuned direction by Michael Halberstam - the focus is on a much earlier period in Newton's career. And it depicts a far more dramatic (and unimaginably painful) event - one in which the scientist subjected himself to an experiment that required injecting a needle into the tear duct of his eye to determine whether light took the form of waves or particles." "...It doesn't help that director Michael Halberstam never locates the humor in his appointed Hnath. Along with Deanna Dunagan's tough/sad/delightful performance as Maxine, Heidi Stillman's best tool for shaping Lookingglass's successful Death Tax is her recognition that much of what goes on in it can be darkly hilarious. Halberstam tends to substitute a smirking cuteness for humor, which means that neither Grapey nor the marvelous Elizabeth Ledo-giving a powerfully plain performance as Isaac's putative girlfriend, Catherine-can make Isaac's Eye work." "...Playwright Lucas Hnath's playful portrait of Isaac Newton begins with a narrator figure introducing us to the bygone concept of "aether," to which the young Newton was an adherent. Introduced by Descartes, it proposed that all bodies are connected by an omnipresent unseen medium�the aether�that accounted for the transmission of force between bodies at a distance. It connected the dots." "...Director Michael Halberstam keeps this talky play moving at a human pulse, not too fast to absorb the edged exchanges between Hooper's impulsive Newton and Grapey's flinty Hooke. Designer Collette Pollard's minimal set allows these larger-than-life characters to fill the tiny space of Writers' black box in Glencoe at Books on Vernon." "...The trenchant playwright cunningly contrasts these amoral seekers of truth with the real-life people they hurt. Hnath makes this showdown contemporary: His vernacular to scatological dialogue delivers many shocks of recognition. Hnath eschews adverbs and adjectives, preferring a text message-like directness and deliberateness. (The almost child-like talk is strictly subject-verb-object throughout, sometimes verging on A.I.-robotic.) As playful as it is precious, it makes this two-hour actors� exercise flow swiftly and hit hard. Ably aided by Halberstam�s even-handed, very grounded staging, with its four rooted and revelatory performances, Isaac�s Eye cleverly manipulates an audience�s allegiances, shifting loyalties from Hooke to Newton until finally the only characters we care about are not them. For all its blunt and glib cockiness, Isaac�s Eye is that rarity�thinking theater with a huge heart." "...Why did (fact) Isaac once insert a long needle �between my eye and the bone, as near to the backside of my eye as I could�? Did Isaac really want to find out about the fundamental of colors from light or what? This most engaging play uses wit, dark humor and intellectually stimulating logic to get us into the minds of inquisitive thinkers � both Newton and Hooke. The result is a wonderful, off-beat play filled with terrific performances. Jurgen Hooper is wonderful as the quirky scientist who believed in his gift from God; Elizabeth Ledo is fine as the devoted friend to Issac and LaShawn Banks is empathetic as the narrator and dying man. But, Marc Grapey commands the show as the conniving scientist and womanizer Robert Hooke. He drives the story into possible contexts that seem plausible. Could Isaac and Hooke�s actions motivate them into becoming fellow great thinkers? This drama both fascinates us and gets us to humanize the �thinkers� who move the world. Isaac�s Eye delivers an engrossing, fabulously acted, night at the theatre. You�ll enjoy this unique play." "...The story that Hnath tells us is of a young Newton who has discovered what he thinks is his ticket into the highest of honors. He has written to the most notable of scientists, Robert Hooke Marc Grapey,who captures every role he takes on to perfection). Hooke, however, sees Newton as a threat, as he himself has been working on similar projects. Newton is played with great fervor and energy by Jurgen Hooper. Newton has a love interest, an older woman who has watched him grow into a man-Catherine (another incredible performance by Elizabeth Ledo). Catherine is ready to get married and have a child and as a teen, decided that Isaac would be her mate. During the story we also find that Hooke begins to desire Catherine so that he can settle down in his declining years." "..."Isaac's Eye" places Hnath securely on the "young playwrights worth watching" list. His play is imaginative but under control. If interest decelerates a bit in the second act, the entire evening still entices viewers who can appreciate a play that goes its own way with confidence and invention. The grouping of Hooper, Grapey, Banks, and Ledo on the same stage is particularly felicitous. So the show is rewarding to open-minded patrons ready for something different in their playgoing."